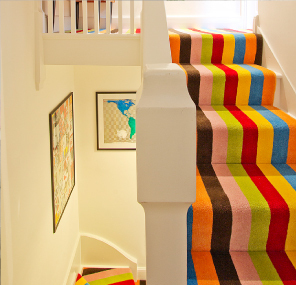 A bold, funky stair runner and landing carpet for a family home in Canterbury. Our client, an interior designer, wanted a bold and fun, as well as durable and reasonably priced, stair and landing carpet for her own home. After considering several ‘off the shelf’ materials we were having difficulty in finding a fabric that matched her requirements, specifically with wide even width stripes. Discussing this with one of our favourite UK niche manufacturers, we explored the bespoke options available to us. 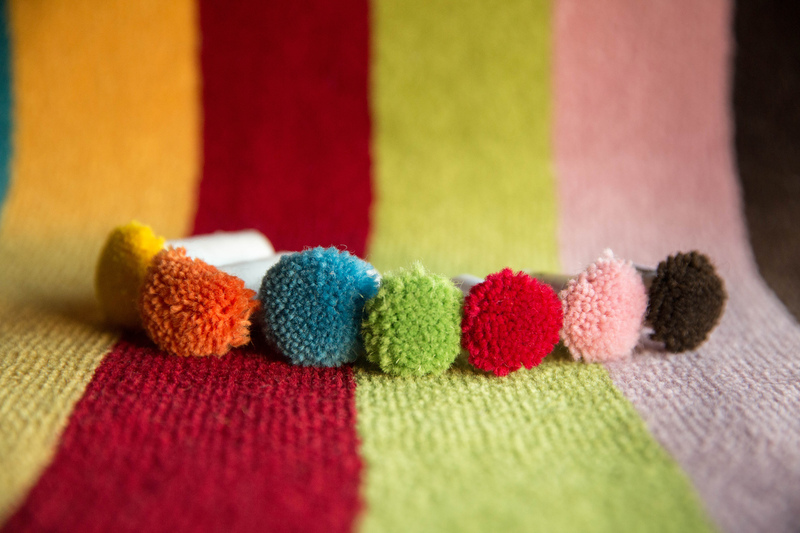 Their pass machine has a pattern repeat of 500mm, so by selecting seven colours from our assorted tuft boxes a perfect stripe width of approx 70mm was achievable. Landings were fitted first and then runners cut to size to match up the stripe colours perfectly. Runner edges were finished with surplus yarn supplied by the factory, to match the carpet colour that fell on either side. The final result was both light-hearted and daring; with an 80% wool composition and 56oz pile weight this staircase will look stunning for years to come. 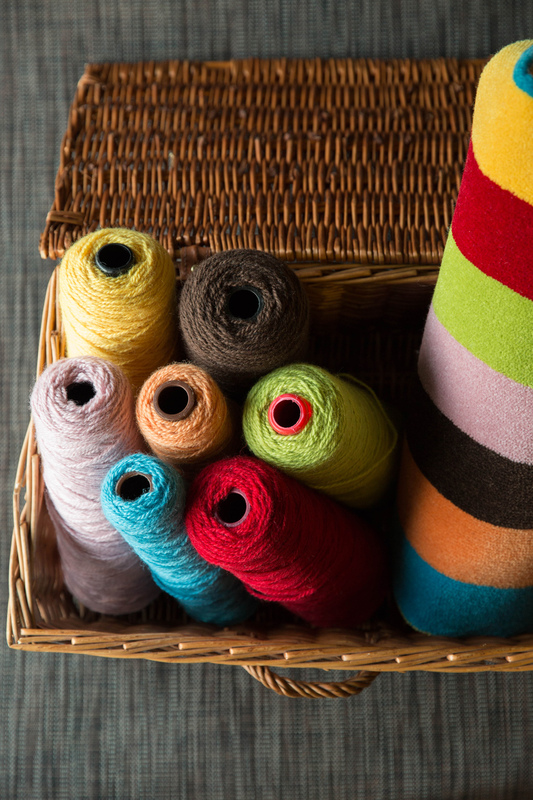 I have worked with Warp & Weft over the past 10 years. With Matthew's excellent, up-to-date product knowledge he makes an interior designer’s life easy. Nothing is ever too much trouble. Highly recommend his service. Runners were cut down to line up perfectly with the landing carpet. Perfectly dyed yarns matched our requested colours. A matching whipped edge allowed bold colours to do the talking. 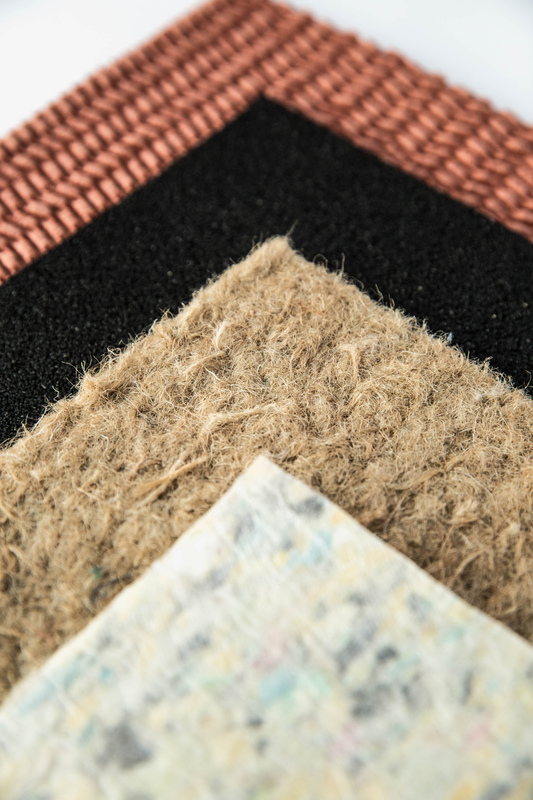 From various underlay options a felt/rubber-crumb combination was selected.